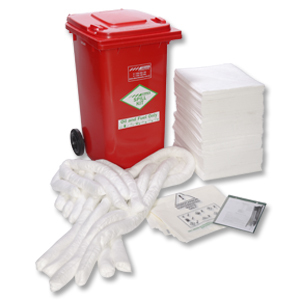 This workshop kit has been specially developed for hydrocarbon spills in factories and workshops. This kit will soak up hydrocarbons but not water and can be easily mobilised and used by one person. * Outdoor situations requiring removal of hydrocarbons from wet areas. * Don’t use this kit for removing waterbased liquids. Instead, use a general purpose or hazchem spill kit.